Water kefir is a probiotic drink that gets fizzy like pop. It’s a great way to get you and your family off of pop if that is an issue for you, since it’s fizzy sweetness has that “pop” feel. Easy to make at home, in any size batches, your kefir starter “grains” will multiply to make larger and larger batches or for you to share with others. They are not really grain, but actually a SCOBY, which stands for Symbiotic Culture Of Bacteria and Yeasts. Start with a 1/2 gallon mason jar filled with 1 liter (just over a quart) of spring water. Add 1/4 cup sucanat or other sugar of your choice. You do NOT want to use honey, as the anti-bacterial properties of honey can destroy your scoby. Add 3 Tablespoons of kefir “grains”. And 2 dried, unsulfered apricots, and a slice of organic lemon. You want to use unsulphered fruit, as the sulpher in some dried fruits can destroy your scoby. Stir it up a bit, cap it off tight, and write the date/time on there with a dry erase marker. The dry erase marker will be easy to wipe off the cap and is easier to use than tape and will help you remember when you started it. After it has fermented for 24 hours, test it by tasting it. It should still be slightly sweet, with a light tangy sourness to it. If it is still very sweet, let it ferment another 12-24 hours and test again. Using a strainer, pour the “finished” water into a clean jar. The strainer keeps all those little grains safe and sound. Conventional wisdom says that you should only use plastic strainers for kefir, as they can react with metal. I use metal because that is what I have. Personally, I don’t notice a taste difference and I am not currently wanting to spend more money on one. Rinse the grains off well, and start the process over with fresh sugar water and fruit. 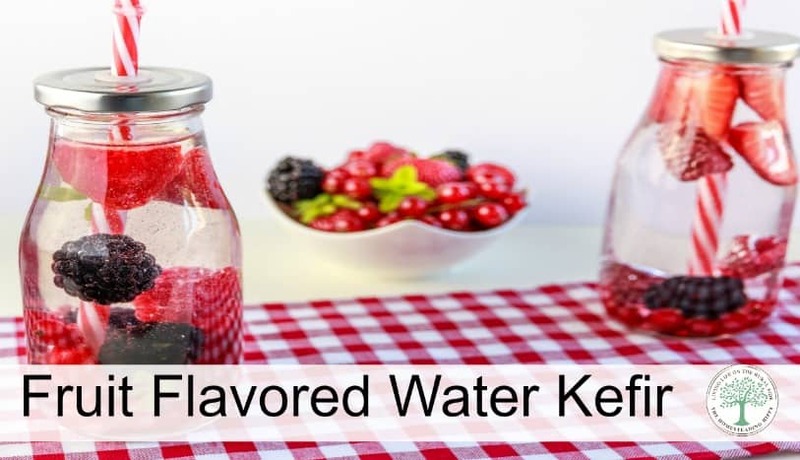 Have you ever made water kefir before? What is your favorite flavor? Be sure to pin this for later! I will have to share this with my mom, she makes kefir daily but I’m not sure she’s made a strawberry kefir yet! I really need to get some water kefir grains! This sounds great! That looks delicious! Can’t wait to try it.